The 13th Earl of Derby (1775–1851) seems to have played a key part in the introduction and maintenance of exotic domestic breeds into Britain. He was President of the Zoological Society of London from 1831 until his death, and he also maintained his own menagerie at Knowsley Park near Liverpool. 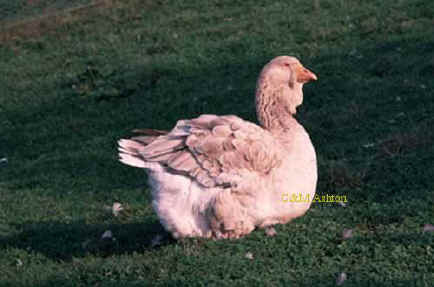 Writing in 1850, Nolan observed that some fine specimens of the breed of Toulouse ‘have been recently introduced by the Earl of Derby, and is indiscriminately known as the Mediterranean, Pyrenean , or Toulouse goose, and from size and quality of flesh found a most valuable addition to our stock. With the exception of their great size, they resemble our common domestic geese, but of a much more mild and easy disposition; and what is more important to the farmer, they never pull the haystacks in a haggard. Their prevailing colour is blue-grey, marked with brown bars; the head, neck . . . and then back of the neck, as far as the shoulders, of a dark brown; the breast is slaty blue; the belly is white, as also the under-surface of the tail; the bill is orange-red and the feet flesh-coloured, The London Zoological Society have pronounced them to be unmixed descendants of the grey-lag’. 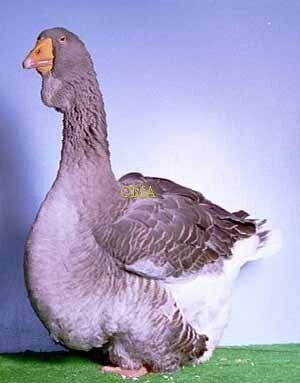 Toulouse are very similar in their requirements to other breeds of geese, but the larger exhibition birds in particular do need more care. 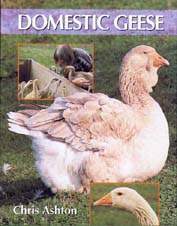 Despite this, people starting with domestic geese often seem to opt for Toulouse, perhaps because the name is well known, perhaps also because of their temperament. Toulouse plumage is fuller and softer than the average farmyard goose, especially in the larger, exhibition birds. In continuously wet weather, older Toulouse need shelter at night, and cannot be left out in a fox-proof pen 24 hours a day. Rainfall was so high last year (2000-2001) that some six-year old birds appeared to suffer from ‘wet feather’. This is a condition where the feathers never seem to dry out. There are various causes of this condition. The cause of ‘wet feather’ in the Toulouse last year was simply that the soft plumage does not cope with continuous rain, and the only solution was to house the older birds on bad days. Paradoxically, the main way to avoid this condition is to ensure that birds have access to bathing water throughout the year, and so can keep themselves clean. In this way they keep their feathers in good condition by washing, preening and spreading their own preen-gland oil over their plumage. Hopefully this summer’s moult has allowed the birds to replace their plumage with good, new feathers ready for this winter. Toulouse are not hardy grazers. Smaller geese such as the Pilgrim and Brecon Buff subsist well on correctly managed pasture, but larger Toulouse also need concentrated feed. Larger domestic animals, and birds, usually have a higher food demand than their smaller, hardier, cousins. Large domestics are so because of selection by humans for rapid food conversion and weight gain. These birds generally need to be fed a more concentrated diet when they are adult as well. To reach their full potential, Toulouse must be fed pellets (for waterfowl) in addition to their grazing. 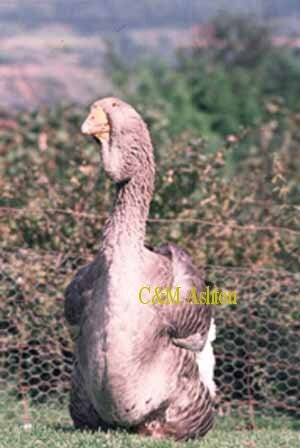 They are much keener to eat pellets than any other breed of geese, at all stages of growth, and as adults. Do not, however, let the birds become over-fat or over-weight. This will certainly shorten their life-span. If insufficient concentrated food is available, the birds will become under-weight, and also do their best to gain nutrition from grass. Whilst geese are ideally grazers, it is important that the grass is short and tender. If it is too long and stringy, the bird can suffer from impacted gizzard. With Toulouse in particular, make sure that they have the correct food, are wormed regularly, and that they have access to sand and grit. Exhibition gander, Champion waterfowl twice at the BWA National Show, UK.